A new field for me but with some familiar territory such as high voltage power supplies. 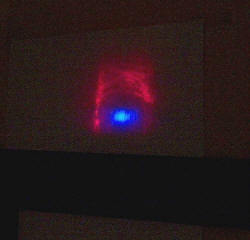 My Nitrogen laser with a diffraction pattern. 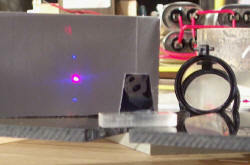 This is a home made laser in free air with no mirrors that gives an ultra short ultraviolet pulse. Typically at atmospheric pressure in air (78% nitrogen) the laser pulse discharge is only about 1 nS and occurs at 337.1 nm. 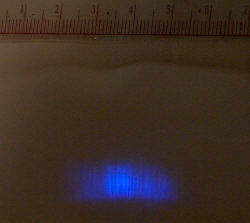 This means that the light pulse is only 1 foot (30 cm) long. After this there are more nitrogen molecules in the lower than the higher energy state and lasing ceases. The lower level lasts very much longer before lasing can take place again. These ultra short discharges mean that they are extremely sensitive to any inductance in the path. The graphic (borrowed from my wife's unrelated webpage) gives a sort of idea of what is happening in a superradiant laser (ie light has only one pass with no mirrors) and has a beam from both ends. The power in each pulse however is typically 155 uJ measured on Joshua's power meter on his similar laser. At 1 pulse per sec this means that each pulse delivers a peak power of 155 kW during the nanosecond that it is on. At 6 pulses per second this is 1 megawatt peak power (sort of) and average power of 1 mW which is the same as a handheld diode laser. Lower pressure and pure nitrogen lasers are much less critical with discharges of typically 20 nS. Nitrogen laser Mark 1 My first (unsuccessful) attempt at a transverse excited atmospheric pressure (TEA) nitrogen laser and why it didn't work. This is a home baked item made from 3 aluminium sheets. A bottom full sized one and a split upper one with a spark gap between. The gap is about 1mm and the two upper sheets are joined by a 10 turn inductor. One of the upper plates is discharged to the lower plate with a separate spark gap. It is all run from about 9 kV. The capacitance of the combined upper plates with the lower plates is 4 nF. The upper sheets measure about 16 x 20 inches (40 x 50 cm). 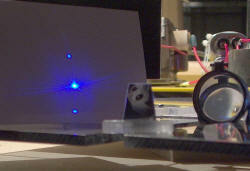 The main gap is shown firing and the paper coloured with a fluorescent marker is shown at the top of the picture lighting up but not lasing. I subsequently learnt that this would not work for several reasons. Firstly, I was putting too much voltage and power into it. The spark gap repetition rate is in the upper audio range and it really squeals in action. The optimum for N2 lasing is much lower and often less than 25Hz. Secondly, the effective 1/4 turn of the stepped up rails was probably significant factor at reducing the discharge rate and has far too much inductance for nanosecond speed discharges. Thirdly, I needed to use a much thinner dielectric and a lower voltage. I was using up to 4 layers of 8 mil (0.2 mm) polyethylene groundsheet to standoff the voltages of up to 30kv that I was using. Nitrogen laser Mark 2 My second (successful) attempt at a transverse excited atmospheric pressure (TEA) nitrogen laser and why it worked. Success! The little green dot in the photos below say it all. On the left is a clearer shot of the setup without the weights that press the capacitor plates together. It is extremely simple but the devil is in the details. The dielectric was changed from 8 mil (0.2 mm) polyethylene to thinner overhead projection photocopy transparency which is 4 mils (0.1 mm). This is nice and uniform plastic that is rated for photocopy temperatures which is a lot more expensive than usual transparency plastic at about AUD$1 per sheet but I happened to have a box of 50. My spark gap is about 1mm and runs on 4.5 kV which gives a repetition rate of a few Hz only. Running it at 6 kV at a faster repetition rate helps to a degree. 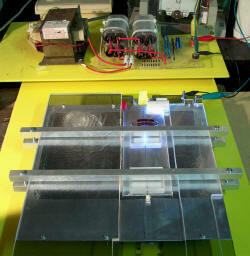 The capacitor plates are 3.5 x 9 inches (9 x 22 cm) and are made of aluminium foil pressed down with weights. The capacitor (both upper vs single lower) measures 10.6nF. This is twice the capacitance in perhaps 1/4 the area and would have much lower self inductance than the previous model. The TEA laser gap is made from brass angle set for about 1mm and is a bit asymmetrical. There is no step up forming a partial turn of a coil with its associated inductance as on the previous model. I have lined microscope slides under all spark gaps to protect the dielectric but at the lower powers I am using they may not be necessary. Earlier and later versions with a close up of the spark gap. The later version works better and has wider cut down aluminium angle without the glass backing. The spark gap goes directly onto the main aluminium plate rather than onto an electrode via the foil. Hopefully this allows higher currents. 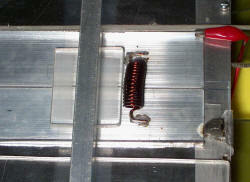 The inductor is aluminium soldered directly to the electrodes. The final capacitance for the setup is 17nF. In action there is a glow between the two plates with some white high intensity sparks. 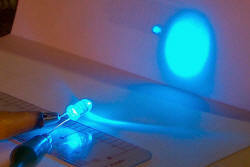 The beam excites yellow fluorescent marked paper to go green and plain white paper to go blue . The beam comes out either end and often both together and flickers a lot. The beam unfocused at 4 feet (1.3m) above, left, then focused with one and then two plastic lenses out of toy binoculars. Note the striations and significant divergence. Scale is cm. 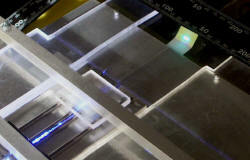 These pictures show a collinear laser diode beam down the nitrogen laser channel. The left shot is of the beams at 4 feet (1.5 m). 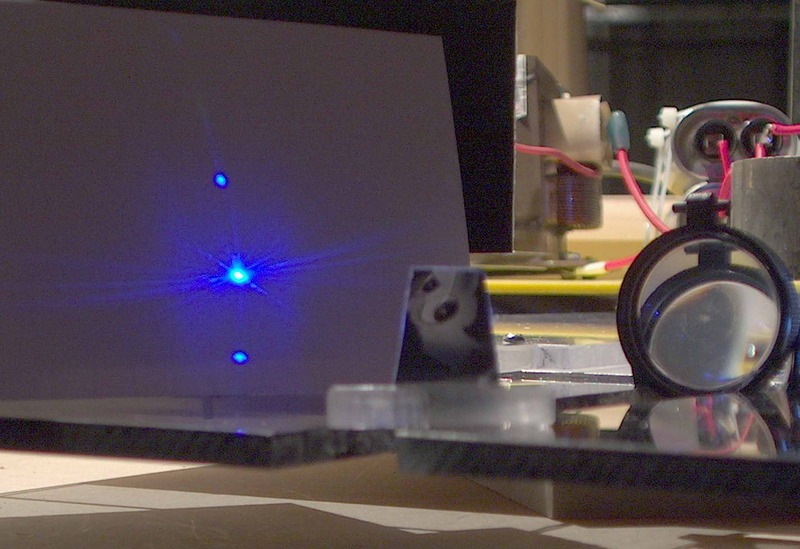 the laser diode beam has spread due to reflections. The right shot is reflected off a fragment of a CDROM (Mario teaches typing - see his eyes). This gives a central reflection and first order diffraction with the ultraviolet being closer and the red diode beam being farther from the central reflection . This confirms it is monochromatic. I've just worked out why this pic looks familiar. It has more than a passing resemblance to a Hubble shot of the Cat's eye nebula. 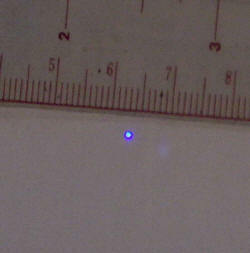 Nitrogen laser Mark 3 I have made a third much smaller laser but with higher power and it can be fired a lot faster. In addition I have a dye to highlight the beam. This was made by dissolving some fluorescent yellow marker pen dye in water. Note the absence of sparks in the channel, just the glow of ionization spread fairly evenly. 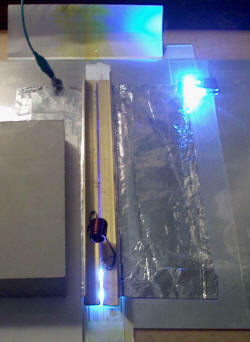 The beam is being reflected off some shiny aluminium foil. The spark gap is made of sections of brass tube. I have taken oxygen from a cylinder, blown across the laser channel. It completely extinguishes lasing for 4 or 5 seconds and it is not restored for almost 20 seconds. Oxygen is poison! It also increased the intensity of the sparks in the channel. Note that none of these lasers, at least so far, have used pure nitrogen. An interesting fact. I have made all my nitrogen lasers with no new expenditure. All equipment was available as scrap. In other words, they cost nothing. A pleasant change for laser stuff. I am curious about my laser output. 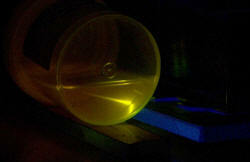 Certainly the output from yellow marker fluorescence is much lower than a 1mW diode laser. 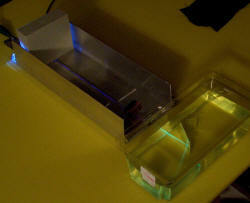 Granted the UV output may be brighter depending on the efficiency of the fluorescence. A UV LED is not that bright either but I don't know the output of the one that I have although typical eBay ones are 2000mcd. Here is a comparison of a N laser beam of about 2mm compared with a 20mm beam of a 5000mcd blue LED (running at its rated 20mA). The brightness is about equal but the area of the LED is 100 times greater. 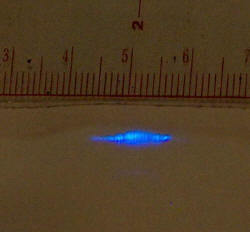 Hence the brightness of the UV paper fluorescence is about 50mcd for my laser. I seem to recall a 14000mcd LED has about 5mW output, hence 50mcd = 0.018mw. A long way from burning paper or causing tissue damage. I have a photodiode linked to my frequency meter tonight to count the flash rate. The photodiode wavelength response is down to only 5% at 400nm and presumably much lower at 331nm but still seems to function directly sufficient to trigger the meter. In practice it is easier for aiming to put some yellow marked tissue paper in front of it and the yellow fluorescence will be much closer to it optimum wavelength. For repetition rates of 1 to 50Hz the voltage after the resistor is surprisingly constant at around 5.5kv and drops to about 4.5kv as the rep rate rises to over 200. Note that my HV meter reads peak DC or peak AC so these values are averages. The greatest total brightness is between 150 - 200Hz and definitely falls off after that. I must admit that this is faster than I had expected. My impression (which has not been tested yet) is that my older larger nitrogen laser doesn't tolerate fast rep rates. Note that 200Hz may not be giving the greatest power per pulse. I could get some idea by measuring relative powers with the blue diode setup as described above but will have to set that up properly. I measured my power input today. 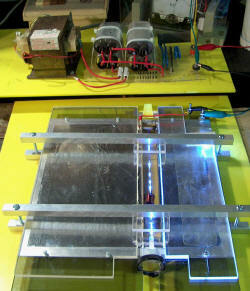 1 With no sparks: There is 200uA leakage at 5kV = 1 watt before any discharge. 2 At a rep rate of 8 input current rises to 500uA ie 300uA above the leakage current. This would suggest an input current per pulse of 37uA. 3 At a rep rate of 200 input current is 6mA. This would suggest an input current per pulse of 30uA with voltage dropping to 4.5kV. Power per pulse is around 135mW and total power is 27W. In terms of efficiency, 27W in and a lower limit of .018mW out gives a spectacular efficiency of around 1 in a million or .0001%. How cool is that. While these figures are a bit rubbery, they serve to give an idea of powers involved. The average voltage falls at higher rep rates but the peak input voltage must be rising or else it wouldn't spark faster! Nevertheless the power input per pulse seems a lot smaller at higher rep rates, hence the limit may not have been reached and the fall in output may be due to power supply issues rather than inversion states with nitrogen lasing at air pressure. At full power I am overdriving my MOT (about1.5kW input) and the dielectric is not likely to last long either at 27W input. I did try my older and larger N laser but couldn't get much above 50Hz before arcing starts to intensify at different points which I suspect is due to localised dielectric heating prior to melting and burning. The larger currents with the bigger capacitor are probably the issue here although most of the current "misses the boat" in terms of lasing. Nitrogen laser Mark 4 Ideal shaping of the laser channel electrodes has been investigated with various profiles (Chang, Rogowski etc) to give a uniform discharge. 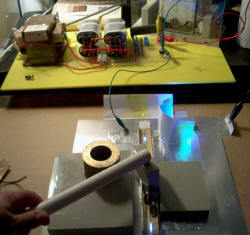 Other amateur experimenters such as Ralphoo have used tubing for the laser channel electrodes. I thought I would try too. Aiming for a larger-than-I-thought-reasonable size, I used 5mm round thoriated tungsten rods. These are very finely finished. No joy with them until they were very firmly pressed down then they really shone and were much better than a beam from the plain aluminium angle I had used before on my test bed laser (Mark 2). Interestingly, I could use a much broader gap over 1mm and the beam was very divergent up to about 6mm only 10cm from the end. One advantage of the rods is that the spark is 3.5mm above the dielectric. Joshua Dickerson who enlightened me (pun intended) in getting this laser going. Mark Csele Extensive descriptions and practical info from a Professor in optics. Dye laser I have some Rhodamine 6G dye which is one of the easiest dye's to lase. It is an intense pink and fluoresces yellow shown on the left below. 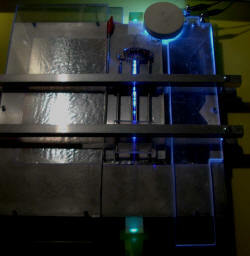 The right picture shows the UV beam passing from right to left. It passes through some colour TV phosphor dusted on the side of a plastic jar and then on through some Fluorescein in alcohol. Note that this is not lasing, just fluorescing. I have made a dye cell with a small plastic cylindrical lens to focus the Nitrogen laser into a very thin line which it does well but not enough to give superradiant dye lasing. I am having problems with leakage both using silicone and epoxy. More attempts soon.